AMEREX installs quality replacement windows, vinyl siding and exterior doors for residential customers in the York, PA area. We also build custom patio enclosures for any home from the ground up. Our product vendors are top-quality and include some of the most trusted names in the industry known for generous warranties and service after the sale. 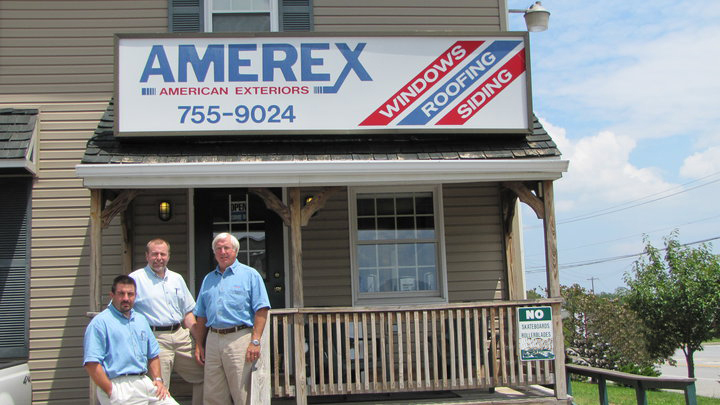 AMEREX was founded in 1984 in a two-car garage and sold 126 windows in its first year. Today, AMEREX replaces that many windows in a single week! AMEREX has expanded over the years to include siding and door installation and patio enclosure work. Charlie Robinson joined AMEREX in 1990 and has been involved in a variety of siding, door and patio enclosure projects as well as over 60,000 window replacements. In 1993, AMEREX moved to their current 2200 square foot facility at 3755 East Market St. in York, PA.
Steve Allison joined AMEREX as a Partner and Operations Manager in 2009, helping to continue our business expansion and ensure continued quality and growth. Today, AMEREX enjoys a reputation for quality workmanship and unsurpassed customer service throughout the area. Many of our expert installers have worked for AMEREX for over 20 years. AMEREX offers free quotes for every project and convenient financing options. We invite you to contact us for more information on our services and put our experience to work for you!